We have now opened the bookings for GAMEX 2019 & 2020 aboard the well appointed and equipped Kylin. We will sell out fast so please book ahead to claim your position to enjoy GAMEX 2019 & 2020 in the best possible way. GAMEX 2019 – Australia’s Best Fishing Competition, Exmouth WA. Montebello Island Safaris based in Exmouth, is offering the following package to fish Gamex for 2019. In the 2014, over the six day event over 600+ Billfish were tagged, which was quite the record. In the lead up to the event Angler Rowan Smith caught an Australian Record Blue Marlin weighing 368.2kg. Tournament entry fees* if required. GAMEX began as a small fishing tournament in 1969; just 2 years after the township of Exmouth itself was formally proclaimed. In 1978 this tournament was officially named GAMEX which rapidly grew in popularity to become Western Australia’s premier sport and game fishing event. 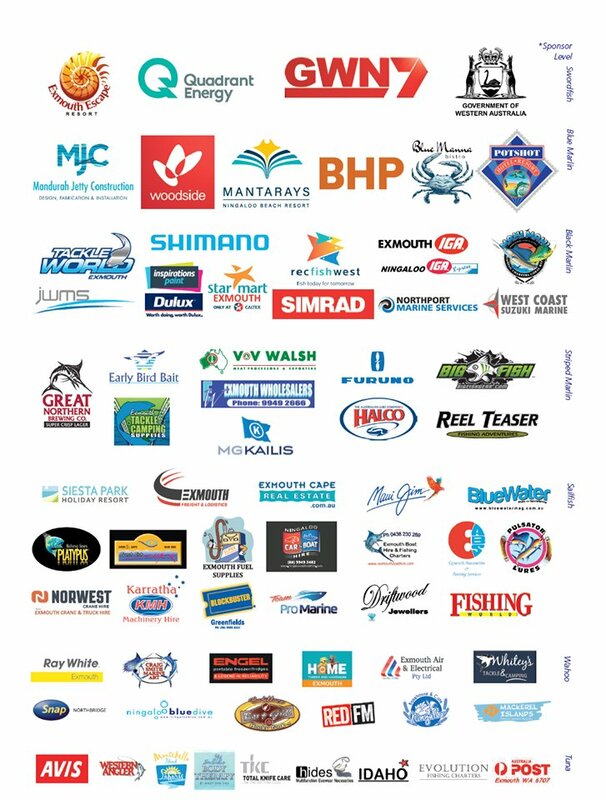 In its 50 year history, GAMEX has been responsible for more state, national and world records than any other Australian fishing tournament. Large and small vessels participate in GAMEX, with experienced and novice anglers fishing side by side. All fishing areas are close to launching facilities, moorings or marina pens, and the wide range of species and tournament sections ensure everyone has a great chance of winning some fantastic prizes. Montebello Island Safaris based in Exmouth, is offering the following package to fish Gamex for 2020. The Exmouth Game Fishing Club invites you to Western Australia’s greatest fishing event – GAMEX. Now in it’s 50th year, GAMEX is recognised by Tourism Western Australia as the state’s major fishing tournament, attracting local, national and international competitors and spectators. Exmouth is one of the hottest game and sport fishing destinations on the planet, with over 40 40 different game fish species on offer, including all six Australian billfish species. GAMEX’s early autumn timeslot typically sees light winds and small seas, however, Exmouth lies within a cyclone prone region and the EGFC recommends all teams have complete insurance, including travel insurance, in case of cancellation. In the event of a cyclone warning or a severe weather forecast, the Exmouth Game Fishing Club reserves the right to suspend or cancel the tournament at short notice. See our website for the full tournament cancellation policy. GAMEX would not take place without the assistance of our valued sponsors and we urge you to support them wherever possible. We also encourage all participants to support the EGFC facilities (Nemo’s Cafe and The Sandbar at the EGFC clubhouse) and to appreciate the efforts of our volunteers and committee who work tirelessly to ensure the success of the event each and every year. The EGFC clubhouse is a licensed venue, so please ensure that children are supervised at all times. No BYO. We wish you all the very best of luck for GAMEX 2018. Enjoy the event but please take care of yourselves, your crew and your fish, and participate with integrity, camaraderie and good sportsmanship. Please contact the club for any direct question in reference to any rules or changes to the event. At least one crew member from each team must attend the briefing session at the EGFC clubhouse, for last minute updates, rules briefing, tournament bags and boat auction. That person must register with the EGFC officials upon arrival. All teams must register before 5pm or penalties will apply. Rules and entry forms can be found at www.egfc.com.au. Your entry fee includes a tournament shirt, team bag full of goodies, team meal vouchers for the Briefing Session, mid-week Social Night and Presentation Night, and event information. This totals more than your entry fee. Please note, late entries may not be able to receive a tournament shirt. All boats must be fitted with an operational VHF radio. Channel VHF 21 is for main communications. Alternative channels are to be used for boat to boat chit-chat. Teams must log on and off each day with Radio Base. Upon log off, those boats that have raised billfish will be asked to provide a Schedule (Sched) for the day which must consist of billfish raised, hooked and tagged. If you decide to have a day off or late start, you MUST notify Radio Base so that we know where you are. If you plan an early start, please notify someone of your intentions and location. SAFETY IS IMPORTANT. All competitors participating in GAMEX fishing competition do so entirely at their own risk. Exmouth Game Fishing Club Incorporated and the GAMEX coordination committee shall not be held responsible and will not accept any claim for loss or damage sustained by any competitor to their person, personal effects, or vessel in regard to this tournament. GAMEX is a WAGFA sanctioned tournament with all fishing to be conducted in accordance with GFAA rules. Billfish must be tagged with NSW Fisheries billfish tags only. Sharks must be tagged with NSW Fisheries shark tags only. Plastic dart tags are not to be used. Please ensure this or your catch will be disqualified. Each tagged billfish must be called in to Radio Base as soon as possible after tagging. Details required to be reported are boat, angler, species, line class, estimated weight and time tagged. Fully completed tag cards must be presented to the weigh station during weigh in times on the day of tagging unless otherwise arranged with the weigh master. All fish to be weighed must be brought in on the day of capture. All fish captured must be in edible condition to be accepted at the weigh station. All captures and tag cards must reach the weigh station prior to close each day, unless otherwise arranged with the weigh master under special circumstances. Close of tournament is 8pm on the schedule day. No captures or tag cards will be accepted for tournament points after this time. No fish are to be hooked after 5pm lines out each day. Lines out on selected day (mid-week Social Night) is at 3pm. Radio silence is to be observed for the final 15 minutes of each fishing day for any hook-ups to be reported to Radio Base before lines out. Fish hooked prior to lines out on ANY day must be called in to Radio Base and may be fought past lines out, but all captures or tags must reach the weigh station prior to close each day. Day 6 – Boat with most tagged sailfish. Sponsored by Mahi Mahi Charters Compulsory registration at the clubhouse. All teams must register by 5pm or penalties will apply. Sunday March 18th Fishing commences. Free family fun day at the clubhouse for visitors and locals. Monday March 19th Fishing continues. Sponsored by Exmouth Escape Resort Fishing continues. Tag card verification and weigh in at the clubhouse. Wednesday March 21st Fishing recommences. Thursday March 22nd Fishing continues. Sponsor appreciation function at the EGFC clubhouse. Friday March 23rd Fishing continues. Team RSVP for Saturday night Presentation Dinner to be given on final radio log off. Section 12 Sponsor: TOLL Exmouth Freight Co.